Rice, primarily a cereal gives you carbohydrates and also ‘proteins' (5.2 g protein/150g of cooked rice). Rice falls to both whole grain (brown rice) and refined grain categories (white rice), depending on the extent of milling process. Carbs fuel your body. Though rice is a good source of complex carbs, it offers fewer calories when compared to a deep fried food. Whereas, rice when eaten with little or no fat, provide important B vitamins and also low in calories. In fact, a few fad diets, recommend rice-diet for weight loss! Rice no doubt has a high glycemic index and has to be limited for diabetics. But, if you are regular with the exercises, medications and follow a balanced diet, limited rice intake will not pose threat to the blood sugar. Rice is easy to digest and least allergic, best suited for gluten-free diets! Combine beans/any legume with rice to get complete proteins! This combo is a good source of iron, protein and vitamin B. Throw in lots of vegetables to compensate for the high glycemic index of rice and also to increase the fiber content! Replace white rice with brown rice, if you are a rice lover. It gives you satiety even with smaller quantities! Avoid variety rice like fried rice/biryani as they increase the calories. Prefer it with dal or vegetable gravy. Use fork while eating variety rice to avoid going overboard. Go ahead and grab your cup of rice, provided you know where to stop! 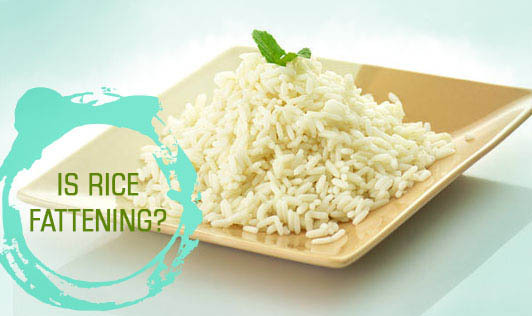 Eating rice is all about choosing the right portions, the right accompaniments and also moving your body for exercises.